An ex-pat ice cream man has swapped the South Downs for the sunshine of California – and is hoping British 99s, cornets and lollies will go down a treat. Bill Richards will soon be selling traditional treats from vintage vans he is having specially shipped to the States. 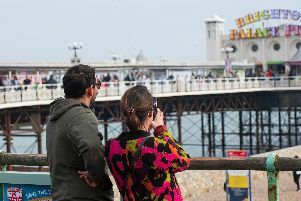 He said: “I have been living in the States for almost 30 years, but I came over to the UK a few years back for a holiday with my family, who still live in Worthing. Bill launched a search for a genuine 1970s Bedford ice cream van but the few he found were in poor condition. Luckily, his brother Ray spoke to an ice cream vendor in Worthing, who agreed to sell his older vans – one of which he had had since new. But Bill then faced the problem of getting his vintage vans out to his home in the States. He called in international auto shipper specialists 1st Move International to whisk the 1974 and 1976-plated Bedford Ice Cream vans out. The vans are now on their way to Bill, having left Worthing for Southampton, where their transatlantic voyage will begin.